Every year the Hala Febrayer celebration and shopping festival happens from end of January to end of February. The Hala Febrayer celebrations kicks off with the carnival. This time the carnival was held at the Gulf road near Kuwait towers on Friday 29 February. 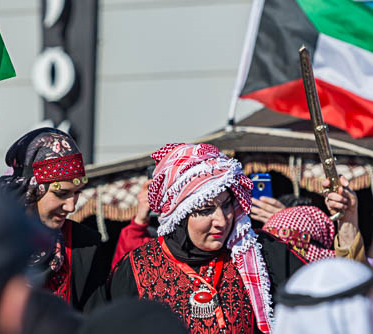 We parked our car in a residential area near Mais Alghanim restaurant and walked towards the Kuwait towers as there were road closures to facilitate the parade and floats. We missed the air show and water show that happened between 1 pm and 2.30 pm. I am sure that would have been really nice. We left home late and could only reach only by 2.45 pm. The entire one kilometre stretch from Kuwait towers was packed with people and children. Interesting and varied display of army, air force and marine vehicles, helicopters and weapons used in warfare attracted quite a crowd. Cartoon characters and Batman kept posing with children for photographs. Close to towers near the beach, the Lebanese corner had dancers and musicians performing to traditional music, quite a hit with the audience. A stage was set up for childrens' cultural programs; there were embassy stalls and vendor stalls. I didn't have time to cover that area since it was almost time for the parade and floats. Tempting food stalls had plenty of visitors queuing for delicious food and beverages. We had shawarma as we waited for the parade to begin. The organizers were distributing snack boxes with croissant, cheese and zaatar sandwiches, cake and juice to the public. A huge turn over of crowd wasn't a surprise which is usual during every Hala Febrayer carnival. The parade started at 3.30pm. It was beautiful to watch the parade and floats. The pictures I took would speak for themselves. Some of them are a bit overexposed though as I stood facing the sun. We had to head to another event so we left after the parade and floats were over around 4.40pm. The cultural shows and food stalls would have continued till night.